Averages 30,000 life hours. T8 fluorescent lamp, 85 CRI, 2950 lumens. 48" MOL, 1.098" diameter. Suitable for IS or RS operation. 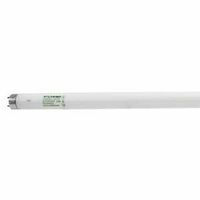 Octron fluorescent lamp, 4100K (Cool White) color temperature, rare earth phosphor, 82 CRI, suitable for IS or RS operation. Suitable for instant start or rapid start operation. 82 CRI. 30,000 average life hours. 24" overall length.